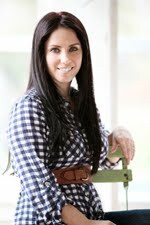 I have been getting a lot of questions about my home and shop this month, so I thought it would be a good idea to do a question and answers post today. What color did you paint your living room and bedroom? it is a Ralph Lauren color. Home Depot still has the Ralph Lauren colors in their system. I used the eggshell finish. How did you secure the doors in your bedroom to the wall? We actually didn't secure the doors to the wall. We just leaned them up against the wall. The doors are secured in place with our bed. What color did you paint your living room? I painted this room a warm gray, called pearl gray. It is a Martha Stewart color from Lowe's. I really only use Mrs. Meyers detergent, along with oxiclean. What color did you paint your daughters' beds? I used two different shades of whites when painting their beds. of White Dove. Both colors are Benjamin Moore colors. What color did you paint your girls room? I painted my girls' room a Martha Stewart's color called Newsprint. I still love this color in their room. It is a really light gray color, and really helps make the whites pop. How did you make the pompoms? I purchased a pompom kit at Michael's. We used these to decorate the inside of a tent at my sister's wedding too. 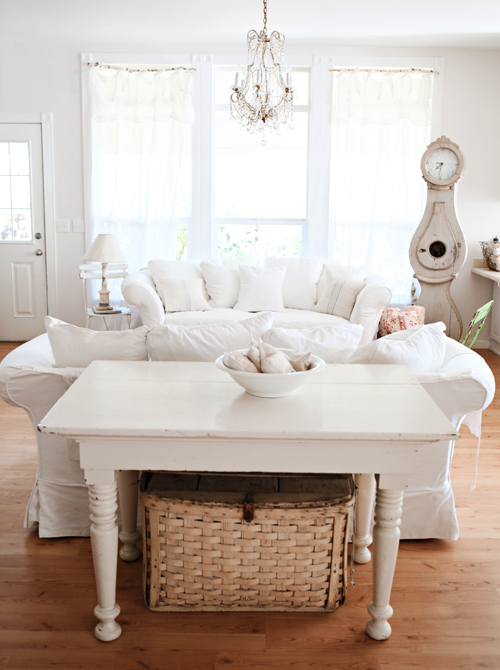 What is your favorite white paint to use on furniture? 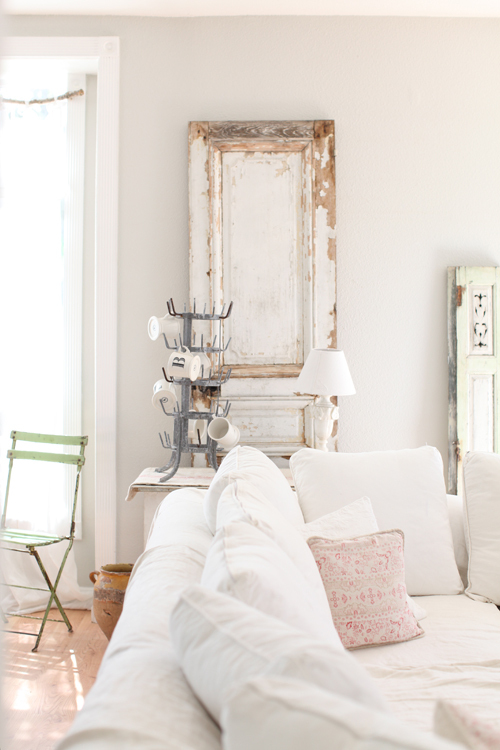 My favorite cool white is, Decorator's White, a Benjamin Moore color. This is the color of paint I used on my table. My favorite warm white, is White Dove, a Benjamin Moore color. My favorite gray to use on furniture is, Horizon. I always use semi-gloss paint as well.... It is much easier to wipe clean, and I personally like a nice glossy white finish on my furniture that I have painted. 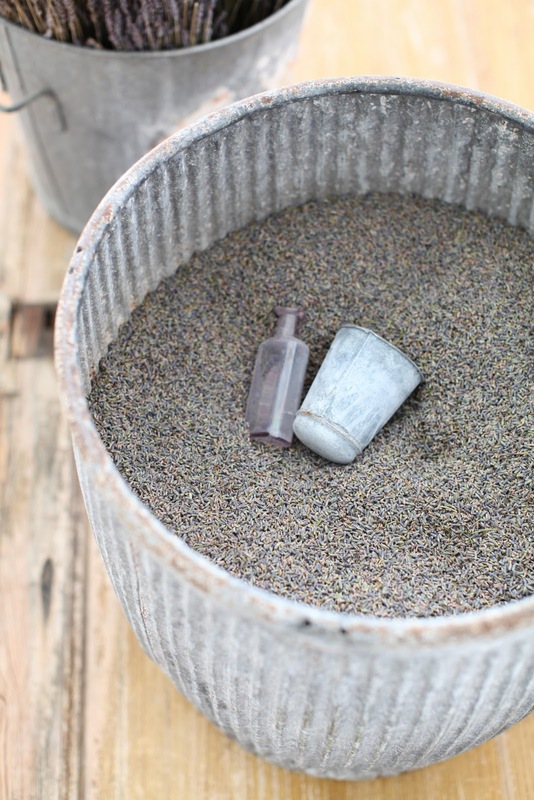 Do you use only lavender to fill your lavender pillows or do you also use a filler? 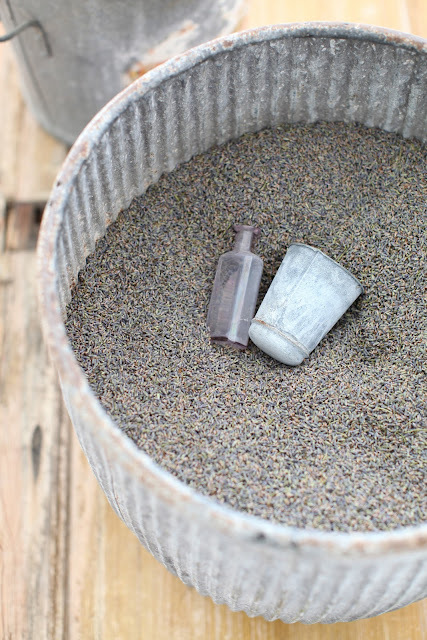 We use only dried organic lavender buds to fill our pillows. Will you be selling bistro chairs? Every time I stop by your blog I never want to leave. Everything it just so pretty and light filled. It amazes me that you can keep it all looking so nice with kids and hubby running around. You must have a neatest family on the planet! LOL. I really enjoyed this post, it's so nice to know all the "insider info" like paint colors and such. Glad to hear everyone is on the mend. Have a great week! Just beautiful Maria! I love coming here and peeking in on your home. It's so restful. Sorry to hear about the sickness in your family- it sure is going around this season. Have a great week! Gorgeous home, and helpful tips...love it all! Thanks for this post today, Maria! I've been wondering about a lot of those questions. Glad to hear you'll be adding bistro chairs to your shop... I've been trying to find some, but have had no luck. Maria your house is like a dream. Thanks for sharing the paint info. I really like the gray in your LR. and thought about for mine,but since you warned about needing light it wont be a good choice for my dark room.Thanks for saving me another can of sample paint.LOL I hope your children are well,pneumonia can be scary. Your house is so inspiring. I don't know how you do it! I have a white slip covered sofa that recently got candle wax spilled ALL over it, haven't even had it a year. I can only aspire to such a beautiful home! Hey Maria~I do hope your kids are feeling better, not good at all. Thanks for all the info. I am starting to paint many rooms and items in my home this spring so this will be very helpful. I enjoy your blog often and no worries if you take a break that's life! Thanks so much for sharing your favourite paint colours....I only wish I could get those paint makes in the UK! Grrr. We do have Farrow and Ball though, which I LOVE!! I hope your children feel better soon. And that you have pletny of being looked after too!! Thank you for sharing everything, especially the paint colors. I'm always looking for paint suggestions. Your home is so beautiful! what a great post!! I really am going to paint my living room...I am a bit afraid I will not have enough light coming in though. We have two windows in it...so much wonderful info you gave us today with this post. Thank you!!! Glad that your family is doing better. Addicted to antique bistro chairs here too, collecting them for years. Off to check out your shop to see what's new sweetie! i'm happy to hear that everyone is feeling better. pnemonia is no picnic. i'm sorry but one of your answers has inspired a new question: when you use 2 whites on a piece, what it your method? layering? blocking? curious as i hope to finally (!) paint my living room armoire. just purchased country almanac. so beautiful! Nice of you to share since everything always looks so pretty Maria! I have Country Dairy on my kitchen cabinets and love it. Wished I'd discovered it before I painted all my walls white! 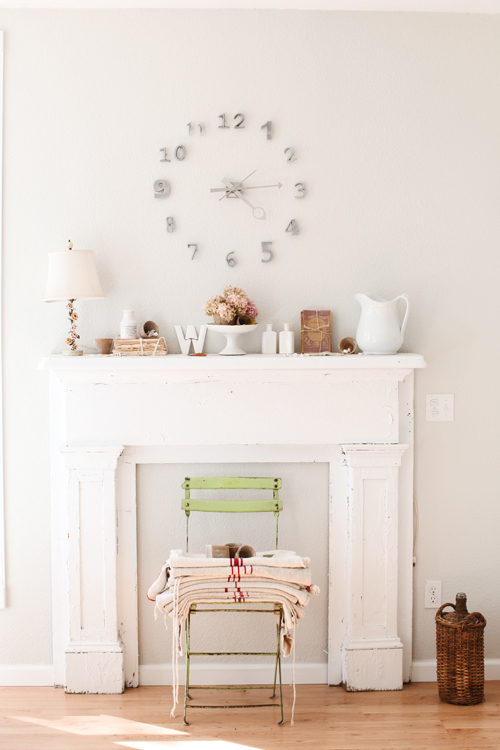 Especially love your Mora clock you found at Red Chair. She's moving to NY! What a good idea! your ideas are so beutiful, thank you to share them with us. I'm so glad you did this Q&A because after the article in Country Almanac, it left looking for the resources pages so I could see what colors you used. Congrats on that article and the soon to be released book. I've preordered mine. Your pictures are beautiful. I love Dove from BM as well. I think I am going to use the color on my benches for the back mudroom! Thank you for the tips Maria...I am itching to paint soem thigns white...I think I am moving away from my more urban stage to a more country stage....and I havn't even seen Fifi's book yet (on order). Glad your family is feeling better and I can't wait for my lavender pillow to arrive. so sorry that your family has had such sickness this winter..praying for full recoveries!! i am dying to go white. i have slipcovered potterybarn sofa and loveseat in a darker color because of the kids/husband and dog. love your blog. thanks for all the color suggestions. i'm obsessed with your home . it's so gorgeous . right now my husband and i are still students , and we live in a teeny tiny one bedroom apartment , and your designs have inspired my home so much . So glad your family is feeling better. Hopefully all will be back to normal soon for you. I always love to look at your pictures, they are just beautiful! 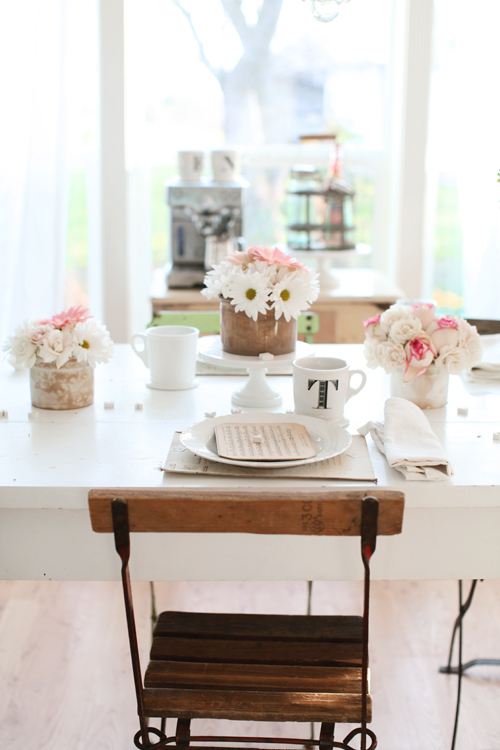 So light and airy with such soft touches of color. Beautiful! Thank you for the mention! You have a lovely blog and store! Thanks for answering some questions, sweet girl. Hi Maria ~ I'm so sorry to hear about your kiddos' illnesses. Poor babies! I hope that they're back on their feet and feeling better soon. So glad that you and your family are feeling better, Maria! It was fun to see the paint colors you've used and some of your resources. Thank for sharing those. Have a great week and take good care! C'est très chic de votre part de répondre à nos questions diverses... Bisous. I came to your blog through the Nate Show...I want to thank you for the inspiration I've gotten. I have felt like a worn out older mother and grandmother, unable to find the spirit to rebuild my nest in a rental house. You have brought my senses alive and helped me find energy again. I am beginning again with renewed spirit... your home refreshes me. 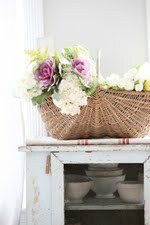 Thanks for these great tips - I just love your decorating style, especially for a family house. So sorry to hear that your little angels are unwell, I hope they're well on the mend by now. Thank you for sharing your choice of paint colors. I have so many rooms to get through in this old Victorian house and have many inspiration photos of your home! can i buy the pompoms? I needed a travelling companion a few weeks ago for a long flight from Seattle to Chicago, so I picked up the newest Artful Blogging. How fun to find your blog article . . . since I already love your blog. Made me feel right at home on a crowded airplane. Wow I just spent a long while on exploring your blog all the white beauty everywhere and your childern are all so adorable. 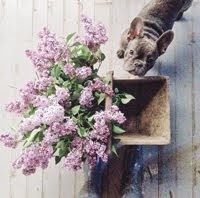 You have amazing chic taste, I'm definantly a follower now and I'm glad I ran into your blog. Your home is so beautiful...so clean and airy with all the white. I love combining wood elements with white like you did with the doors. 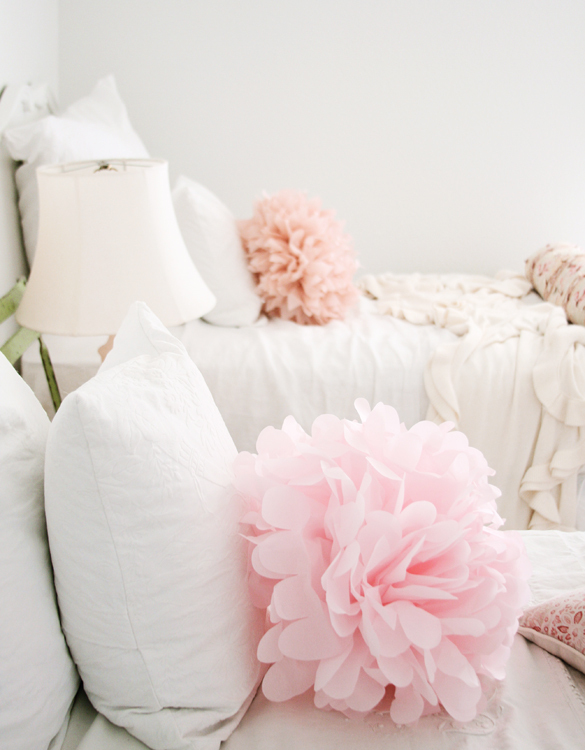 The pom pom pillows are so pretty and really add a nice contrast to the white. Maria, I think this post should be added to your sidebar so your admirers can find the answers to the questions most asked! Love that you shared paint colors, and your revelation that grey makes white pop. Seems pretty obvious, but if you like the white look, a little grey goes along way in getting the look you do so well. Stumbled across your blog, and I am glad I did! I love everything, including your shop! I hope you are having a wonderful week, and I will be sure to stop back by! Thanks for sharing this great post with us. Really amazing and helpful tips. Maria, thank you for the answers! Have a beautiful day! Glad that your family is doing better. Winter sicknesses are NOT fun! First time on your blog, it's très chic. Thank you for sharing the soul of your design with us! It's lovely to visit you! I so agree with the paints you use I have posted colors I use from Benjamin Moore as well. Your home will always be those magazine houses.... dreamy house. maria! your home is beautiful! thanks so much for sharing all the details especially the paint colors! i need to paint some furniture but a litte nervous! i think i might give one of your colors a try! Well, I can't say any word except BEAUTIFUL. I love your home. Wish I can also have a home like that someday. I just adore your beautiful home! Thank you for sharing your ideas ! I love your dazzling home, Maria. Thanks for sharing some info about your home. I really adore the style of your girl’s room and the clock too. Looking forward to seeing updates on your blog. Maria, Every time I see your home I fall more in love! I have been looking for the perfect white paint. Thanks for the info. What a beautiful home you have. At the minute I am currently converting a farmhouse in France and an apartment in Scotland and your blog is full of inspiration - thank you. 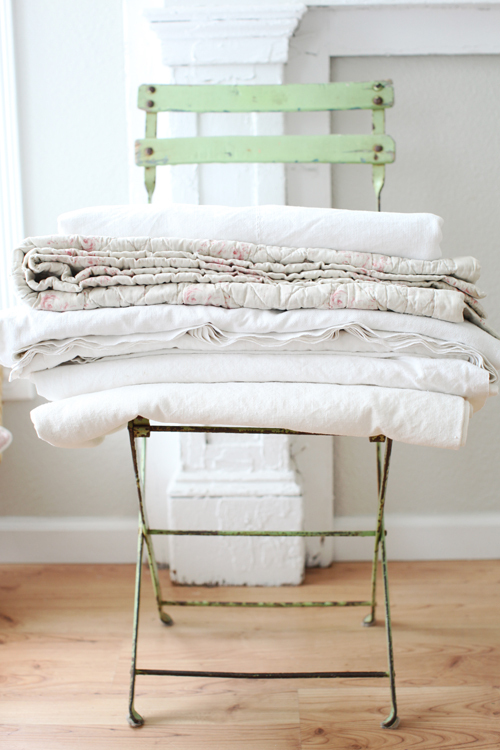 Linen sheets. Hands down first purchase. The chandelier in the bedroom is very nice! i love your style!!! Lovely and inspired!!! I love the way you've decorated your home. Beautiful. Your home is so dreamy....wish I could decorate like this. The whites are so calming and refreshing. Thanks for sharing. wow...gorgeous... I love your style.. you've decorated beautifully. 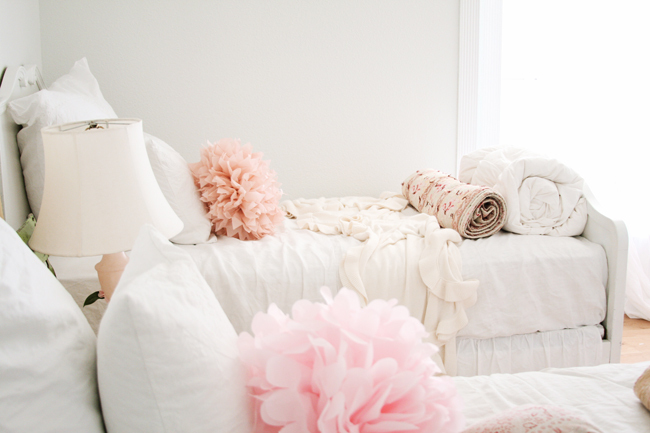 I love that clock design and the bed with flower,furniture are awesome.. I'll try in my home.. Thanks for this new ideas.. I love your girls' room but am curious how you've decorated your boys' room(s). I'm trying to brainstorm how to decorate my son's room so that we'll both be pleased. Ideas?? Thanks a lot for sharing this amazing information. Its just like my dream home. 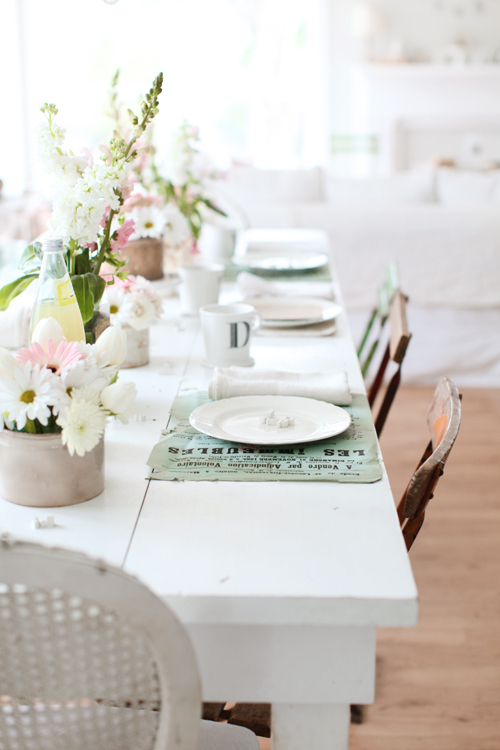 Gorgeous decor and inspiration. It certainly is dreamy. 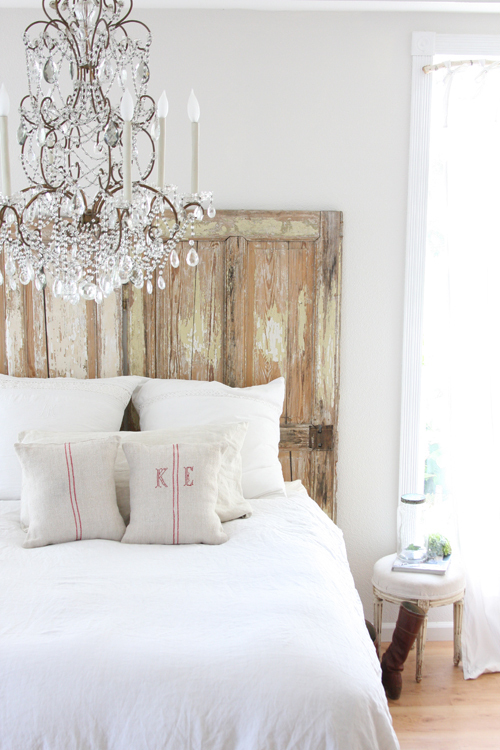 Would love to feature your headboard on my blog...www.tuttobellablog.com. Do I have your permission to use the photo and of course attribute to you? Thanks so much! I love your blog.I've been looking for inspiration for a while, and I just found it :)I don't think I know anyone who loves white as much as you do. Keep on blogging! Hi! I found your fresh, white images while tooling around Pinterest. I'm a huge white-interiors fan, and I'm about to paint my mantle from black to white. I wonder if you would use the same 2-color approach to mantles and other woodwork that you did for your daughters' beds and other furniture. 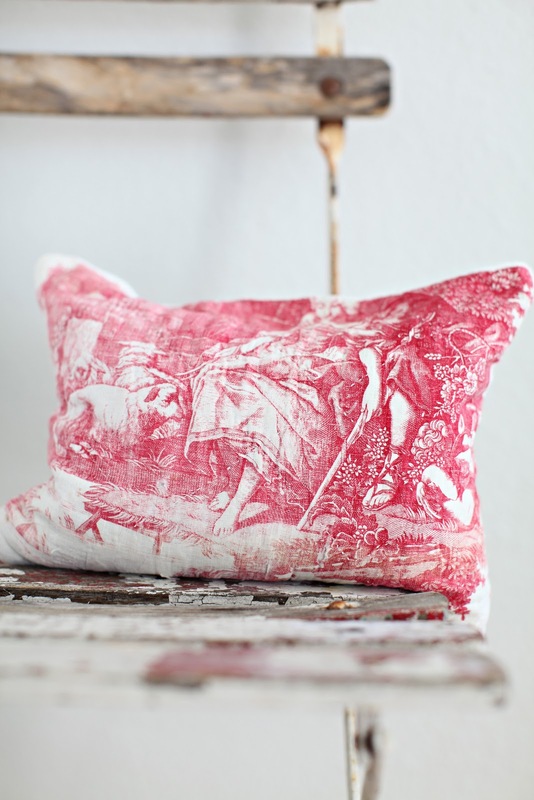 Also, I'm really curious about how you cover your couches in antique sheets. 1) Where do you find these sheets?! and 2) How do you cover them? So where do your FIVE children play and live, in order for you to keep the house white like that? Are they even allowed to play or touch anything? Love your daughter's beds! Were they antiques that you found or are they from a store somewhere?? Hi!! I love love love your home! I have a question...where did you purchase your Swedish floor clock? I am having a terrible time locating one. Hello Maria..you do indeed have a lovely home. I have another question however. I grew up in the Sacramento surrounding area and was wondering if you have family in that area? Or your husband, as your last name indicates. If so please let me know. What camera and lens do you use to get your stunning photos. What settings is your main setting to take indoors. Love your home...I would love to have a home like that but where to start? great deal. harga promo . The posts is rather fascinating. harga promo . Really wanted to express I'm just thrilled that i came on your website. Thank you so much! This is an good online site. harga promo . Espero tu rápida respuesta para saber que cachorro vas a querer. and visual appeal. I must say you've done a superb job with this. .. I'm not even using WIFI, just 3G .. Anyhow, awesome blog! Hi there to every body, it's my first visit of this website; this blog contains amazing and actually excellent data in support of visitors. Hi there, this weekend is fastidious designed for me, since this point in time i am reading this impressive educational piece of writing here at my residence. I have read so many articles or reviews about the blogger lovers but this post is really a pleasant post, keep it up.